What's in Horizon's Frozen Wilds DLC? Clues hint that you'll fight a robot gorilla or bear. In Yellowstone National Park. Lurking in E3’s The Frozen Wilds trailer are hints that Yellowstone National Park is the home of a new type of robot - perhaps even especially made for a New Game+ mode. Most of the details you can guess: there’s a new map, new weapons, and new settlements. 10 hours of hunting in the lush post-post apocalyptic world awaits, with Guerrilla’s Managing Director Hermen Hulst calling the DLC “very substantial”. Now all the obvious stuff is out of the way, let’s get to the really intriguing bits - namely the Banuk and their homestead of Ban-Ur. "Guerrilla might have dropped a substantial hint about how big the Frozen Wilds map will be." Cold, inhospitable, and deadly: those aren’t words just used to describe Ban-Ur. The Banuk people aren’t the friendliest bunch, greeting Aloy in the Frozen Wilds trailer with a harsh reminder that she’s trespassing on their land. Some of you will be familiar with their chilly home already. Horizon has a solid history of respecting the, well, history of the locations it visits, as it features faithful representations of monuments ranging from the Air Force Academy to the Pikes Peak Range Riders Memorial. 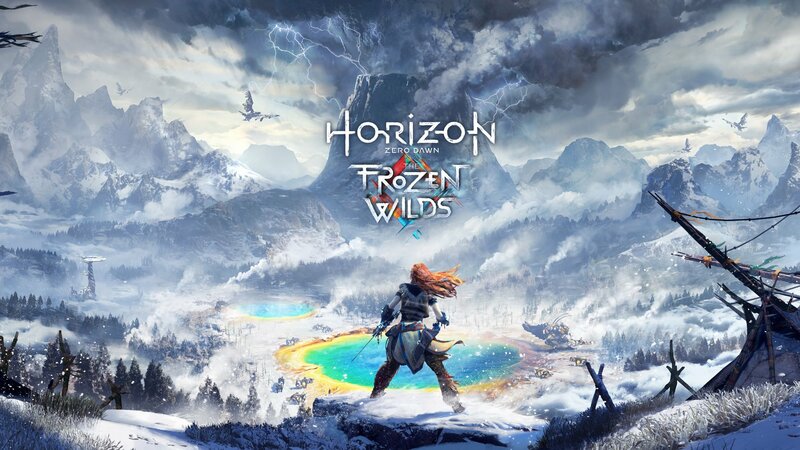 So it comes as no surprise that they’ve done the same in The Frozen Wilds, as this time Aloy is almost certainly taking a trip to Yellowstone National Park and the Grand Prismatic Spring, as you can see the multicoloured hot spring in the promotional artwork for the DLC. Our names for those stunning sites of natural beauty are foreign to the Banuk, though. To them it’s Ban-Ur, described by the Carja academic Aram as being dotted with "billows of steam that erupt from the earth". That description pretty much matches the geysers and hot springs featured in Frozen Wilds trailer, and the Banuk society is no calmer than the bubbling, scalding water located nearby. Siluk, a member of the Banuk tribe, mentions to Aloy during the events of Horizon that recently there’s been trouble in his homelands. Proud hunters and the more spiritual shamans are arguing about how to respond to the changing world around them. It’s likely that this is referencing the Corruption - the virus created by the rogue AI Hades that turns robot animals from tame to ferocious - with the hunters advocating ‘neutralising’ the threat with a metric ton of arrows. I doubt the Shamans (bearing in mind the Banuk people believe they can live in spiritual harmony with the robots) are of the same opinion, hence why some have been exiled from Yellowstone/Ban-Ur by their own tribe. Yet in the trailer we see the Mountain Aloy is eager to delve inside, which closely resembles the famous Devils Tower. Only thing is, that giant rocky outcropping is 361 miles away from Yellowstone National Park. Either the game designers have exercised their creative licence to bring it a bit closer, or it’s a completely new mountain created during the apocalypse by whatever lies beneath. The wide, heavy belly that hangs below the shoulders, and the way the robot moves by simultaneously pushing off its hind legs makes it looks suspiciously like a gorilla. The reaching digits on its left hand as it lands in the snow also look like fingers rather than paws, which would fit the idea of an ape. Either way, there’s a glint of blue on its black (rather than green, which is typically the colour of blaze) so whatever the giant mechanised creature is, it’s probably got a frosty attack that uses the sparkling azure chillwater. The fact Aloy is decked out in her ridiculously strong Shieldweaver armour subtly implies that we could also be seeing the introduction of a New Game+ mode, with an extra hard difficulty for those of you who want to put her skills to the test. That’s good news. I promise. What do you think? Is it a bear or gorilla that’s lurking in the electrical smoke - or something completely different? Let us know your theories in the comments below!